Of the cameras and photographs in the exhibition, few are of such interest and relevance to the Museum as those that once belonged to Miss Acland. Sarah Angelina Acland (1849-1930) was the daughter of Sir Henry Wentworth Acland, the Oxford physician, Regius Professor of Medicine, Radcliffe Librarian and President of the General Medical Council. The family lived in Broad Street across the road from the Museum in a house now demolished. There Miss Acland met many of the famous people of her day who visited her father, including Gladstone, Lewis Carroll, her father's lifelong friend John Ruskin and her own friend William Herschel, son of the astronomer and early photographer John Herschel. Miss Acland took up photography in 1892, developing an interest in colour photography at the turn of the century when it was still in its infancy. She owned a Watson half-plate field camera (Item 5), but the camera she used for most of her colour work was probably the 'Una' quarter-plate field camera made in 1904 by James A. Sinclair of the Haymarket, London (Item 148). 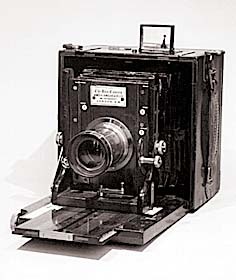 It is a typical mahogany and brass camera of the period, with rising front, ivory focusing scale calibrated in yards for lenses of various focal lengths, spirit level, detachable ground-glass focusing screen with folding cloth hood, and frame viewfinder on top of the camera. Its ground-glass focusing screen matches exactly the dimensions of many of the glass plates in the Museum's collection taken by Miss Acland, several of which are on display. 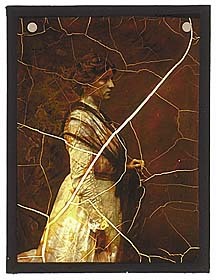 The earliest surviving colour photographs taken by Miss Acland use the three-colour separation technique, in the form marketed in England from 1900 by Sanger Shepherd & Co. (Items 104 and 105). She also tried out the various colour-screen processes as they appeared on the market: Autochrome from 1908, Omnicolore and Dufay dioptichrome around 1910 and Paget's process in about 1915 (Items 109 to 114). Not all of these processes were successful, as her Dufay dioptichrome portrait of a lady demonstrates (Item 112).